There were memorable moments throughout the game, and the internet once again came through as they brought us some great memes throughout the game. Here are some of the more funny images and jokes from Super Bowl 52 in Minneapolis, Minnesota. 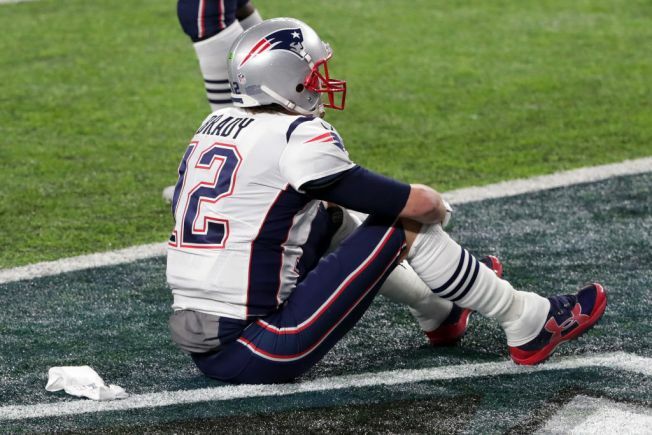 Tom Brady #12 of the New England Patriots reacts after fumbling the ball during the fourth quarter against the Philadelphia Eagles in Super Bowl LII at U.S. Bank Stadium on February 4, 2018. The drought is over and the dynasty might be too. Nick Foles threw the go-ahead touchdown to Zach Ertz with just over two minutes remaining and the Philadelphia Eagles stunned the New England Patriots, 41-33, in Super Bowl 52. Similar to last year's Super Bowl, the Eagles jumped out to an early lead, but Tom Brady and the Patriots rallied from a double-digit deficit to take the lead, 33-32, midway through the fourth quarter. After the Eagles went ahead 38-33, Brady was hit by Eagles DE Brandon Graham and fumbled, rookie Derek Barnett recovered for Philadelphia, and the Eagles were able to put the game away. Tom Brady arrived at the Super Bowl looking like a Bond villain. Minnesota Timberwolves center Karl Anthony Towns wore a "Free Meek Mill" jersey during the game, and the Eagles came out of the tunnel to a Meek Mill song. Tom Brady might be the greatest quarterback of all time, but he's not the best wide receiver. The Patriots trailed by 10 points at halftime, so fans thought Bill Belichik needed to make some halftime adjustments. Of course the Super Bowl would come down to the "catch rule," which NFL commissioner Roger Goodell vowed to change in the offseason. This kid took a selfie with Justin Timberlake and stole the Super Bowl show. He also didn't know the words to any Justin Timberlake song either. Tom Brady won his first ever Super Bowl as a backup quarterback that took over for Drew Bledsoe. Now he's lost to one. Here's an update on all of Tom Brady's Super Bowl appearances and rings. Scooby Doo Ending: Nick Foles is really Eli Manning. The REAL reason why the Philadelphia Eagles won.